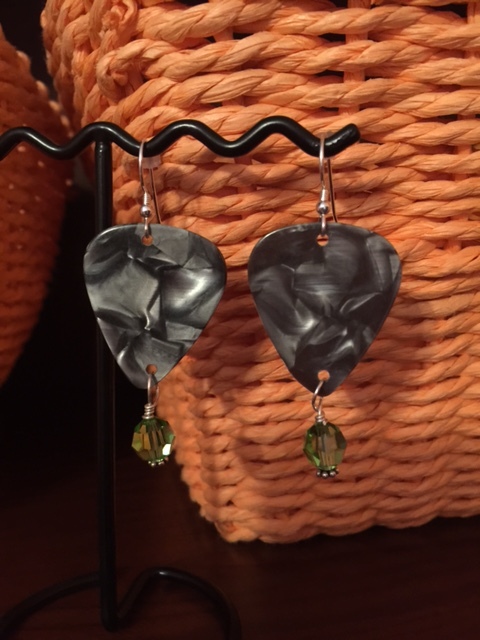 Last week, one of my friends approached me about making earrings for her daughter from some very special guitar picks – Taylor Swift guitar picks. As I was showing Klaudya my array of guitar picks, the ones I bought several years ago with the intent to make earrings, she suggested I practice on them before working on the TS picks. Well, duh. Why didn’t I think of that? I’m usually not a wing-it type of person. All I can say is, I am so glad I took her advice. I placed the punch too close to the top of the first pick and ended up with a nice half-circle from which no ear wire would ever hang. I practiced on four more, two of which are not perfect, but good enough for me to make a pair for myself, and two of which became earrings for Klaudya. Finally, I felt ready to tackle the TS picks. All I had to do was punch a hole at the top of each one. I should mention that one of Klaudya’s friends passed up the opportunity for fear of cracking the picks. I placed the punch on the first one, eyeballed it with my magnifiers, and applied pressure. The punch went through, and I had to work the pick off the punch. No cracks and no breaks. Same procedure and success with the second one. I swear after each punch, I felt like I had just successfully detonated an explosive. Big breath of relief. Klaudya captured my working hands with her phone’s camera. Hard to tell if I was working or shaking. If it’s important, don’t wing it. I’m a big fan of progression, not perfection, but sometimes it has to be perfect. And well, practice makes perfect. 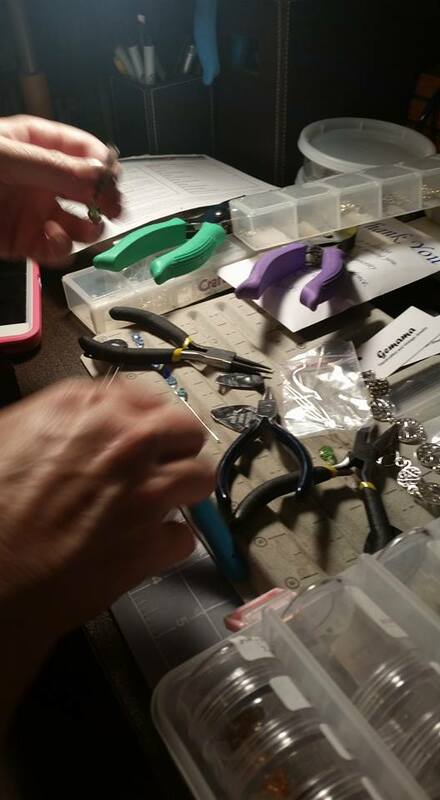 Remember all those wonderful guitar picks I bought eons ago with which to make earrings? I already have a head start from my practice picks. Practice picks that helped to make pickture perfect earrings.